Test the bloom strength of your gels. Gels are widely used in the food, cosmetics and pharmaceutical industries. The TA1 texture analyzer features standard test methods for the measurement of Bloom strength in accordance with GME and GMIA approved methods. 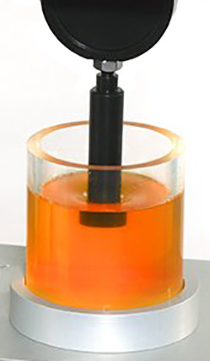 Bloom strength is measured by inserting an AOAC probe a fixed distance into the gel and recording the maximum force.